Bikers amok on the Champs d'Elysee atop wheels of fury...pedestrians scattering...the gendarmes on high alert. It's the Wild One, les Anges de l'Enfer à Paris, without the sullen attitude. "What are you rebelling against, mademoiselle?" "What do have, please, kind sir?" "Horses. I would die for a set of wheels that don't need to be fed." Vera got a velocipede. She was hell on wheels. 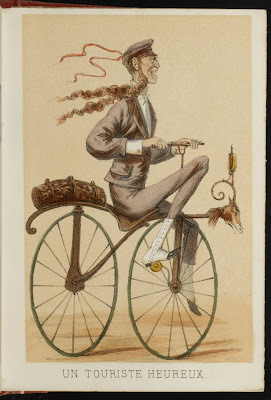 Bicycle mania hit France 1868-1870 like Jacqueline Kennedy hit Paris in 1961. 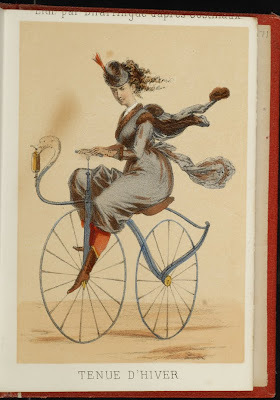 The charming lithographs within La Vélocipedomanie, a most scarce panoramic album, amusingly document and illustrate the fashionable craze for bicycles that swept Paris 1868-1870 as a result of the introduction of Pierre Lallement and Ernest Michaux's lightweight, rotary-crank, pedal-driven velocipede. Riding a velocipede was indeed a chic fad yet one possibly accompanied by an osteopath in your future. This bike was known as the "boneshaker" because of its rigid frame and iron banded wheels. Later in the century and at various times during the twentieth century, these lithographs were reprinted as individual postcards. La Velocipedomanie is exceedingly scarce, with no auction or worldwide institutional records found in ABPC and OCLC/KVK, including Bibliothéque National. There is a copy noted on a Japanese website yet it is incomplete, with only twenty-one of the twenty-five panels present. 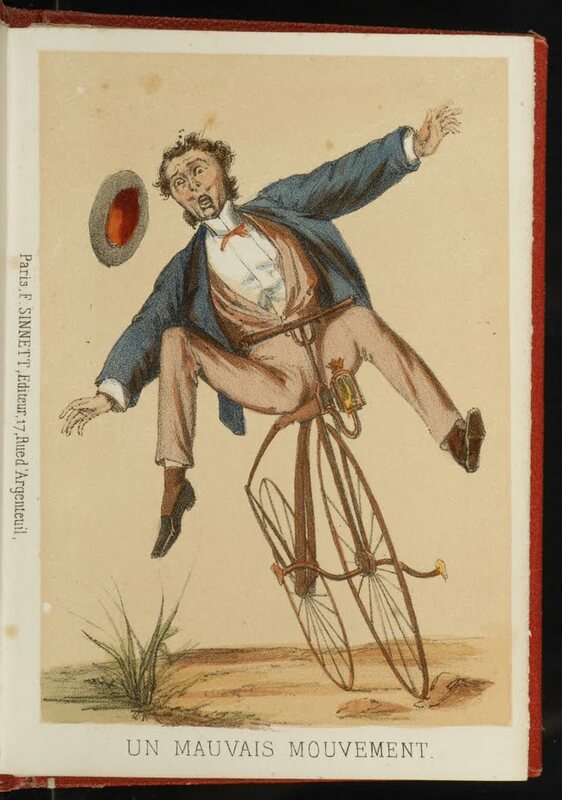 The French weren't the only ones bonkers for bicycles. At the same time across the Channel the British were in the midst of their own mad passion for two-wheelers. Velocipedes. London: G. Routledge, 1869. Gabriel Gostiaux (1838 - ? 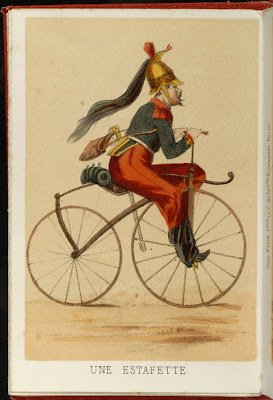 ), the painter and lithographer who designed and rendered the plates for La Velocipedomanie was a contributor to Journal Amusant, Charivari, Surprise, and Fantasie. (Benezit). "Aware that my countrymen are ever amateurs of engravings, lithographies, etc., I must repair the omission of having forgotten to mention Mr. Sinnett, the only English publisher of engravings living in Paris, and as he has an enthusiastic passion for the arts, accompanied by the most correct judgment, the selection of his subjects are such as cannot fail to gratify every person of taste; he also acts as an agent both for the Paris and London print-sellers, and by the arrangements into which he has entered, is enabled to furnish individuals with engravings of both countries on the most advantageous terms, foregoing those charges which it is customary to impose under similar circumstances. The English have it, therefore, in their power to procure from Mr. Sinnett any print, whether published in England or France, at a lower price than in any other house in Paris. His address is No. 15, grande rue Verte, faubourg Saint-Honor" (Herve, F. How To Enjoy Paris in 1842. Paris: Amyot; London: G. Briggs, 1842). One hundred and twenty years after the publication of La Velocipdomanie at the height of bicycle mania, a new rebellion was taking place. And women like Vera were again at the forefront, this time, however, as counter-revolutionaries. 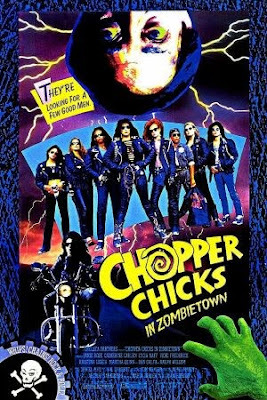 Astride their latter-day velocipedes, they were the only thing that stood between humanity and the apocalypse. Vera's great-great-great granddaughter rode point. [PANORAMA]. Gostiaux, Gabriel. La Vélocipedomanie. Paris, F. Sinnett, n.d. [c. 1868-70]. Small octavo Twenty-five aquarelle enhanced color lithographed panels by Dhartingue after Gostiaux, heightened with gum arabic, in accordian format. Each plate 149 x 105 mm., the panorama unfolding to 105 inches (2625 mm). Printed by Frick Frères. Original red pebbled cloth, with gilt lettering and decorative borders. VELOX (pseud.). Velocipedes. Bicycles and Tricycles: How to Make and How to Use Them. With a Sketch of Their History, Invention and Progress. London: G. Routledge, 1869. First edition. Octavo. Printed and illustrated boards. [BOTTOMLEY, Joseph Firth]. J.F.B. 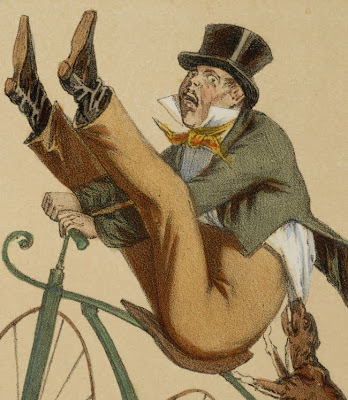 The Velocipede. Its Past, Its Present & Its Future. London: Simpkin, Marshall, 1869. First edition. Octavo, Blue-green cloth. Images from La Vélocipedomanie courtesy David Brass. 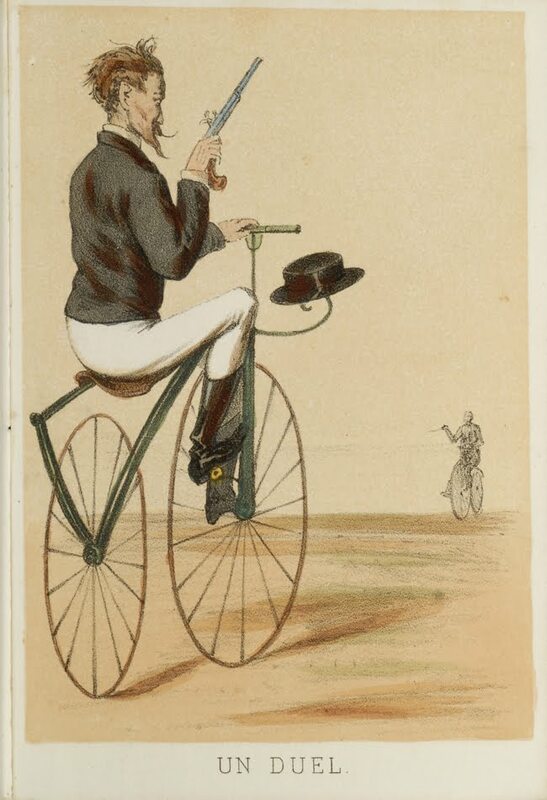 Images of Velocipedes and The Velocipede courtesy of Bonham's.